'remarkable' is a word that sums up the performance of the Be-718s quite nicely." are ultra-clean and neither pushed forward nor recessed. In fact, this is as well-balanced a loudspeaker as Ive ever heard." Features A two-way front-ported minimonitor that's part of Usher Audio's "more upscale" Dancer series. "The tweeter's dome is made from beryllium, "Be" in the periodic table of elements, and beryllium-dome tweeters are all the rage in many high-priced speakers nowadays because of the material's stiffness and light weight." "The Be-718 seems exceptionally solid, and it's heavy -- close to 40 pounds." Use "I suspect that the sensitivity is overstated, somewhere below 85dB. This doesnt have anything to do with sound quality, but it does mean that youll need a sufficiently powerful amplifier in order to get the best from a pair of Be-718s." "Because of its thick frame, the grille is as sonically obtrusive as they come. Remove it for serious listening." as close to state-of-the-art sound as you can get from speakers that cost less than $3000." A number of months ago, I reviewed Usher Audios budget-priced V-602 floorstanding loudspeakers. When I received those speakers, I knew very little about the company -- that it was based in Taiwan and Dr. Joseph DAppolito was somehow involved. Thats it. I had no idea where the speakers fell in Usher's broad product line. However, upon listening to the V-602s, I quickly realized that I should brush up on my knowledge a bit, because Usher Audio seemed like a force to be reckoned with. I found that speaker to be well built and exceptionally good-sounding, especially when you consider its asking price. In fact, the V-602 is something of a steal. Therefore, when Usher asked me to follow up that review with an evaluation of one of the company's more upscale models, I was happy to oblige, if only to hear what the Usher gang could accomplish at a higher price. The "more upscale" Be-718 is a stand-mounted design thats the smallest and least-expensive model in Ushers six-speaker Dancer series. 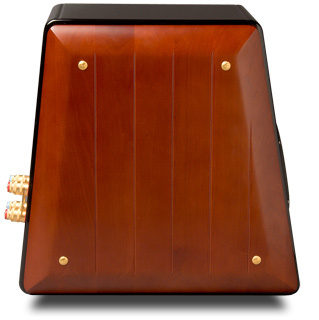 Its priced at $2795 USD per pair -- more than two-and-a-half times the price of the V-602 -- plus you need stands. It's a design based on Usher's X-718 thats priced at just $1300 per pair and a part of the X series, one step below the Dancer series and one step above the V series, to which the V-602 belongs. For someone like me, whos usually all about "high value" and "affordability," Usher has set quite a hurdle for itself by asking me to review the Be-718s. 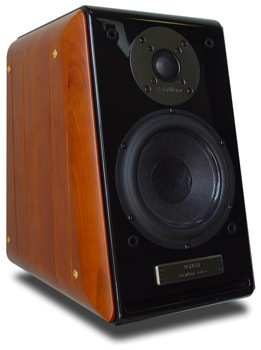 But, as youll read, this speaker surprised me even more than the V-602. As I mentioned, the Be-718 is based on the X-718, and it looks quite similar, using an angled cabinet of generous proportions, 16"H x 10 1/2"W x 15 1/2"D, that may or may not be exactly the same as that for the X-718. Im not sure because Usher didnt supply me with that information, and I dont have an X-718 on hand. Whatever the case, though, the Be-718 seems exceptionally solid, and it's heavy -- close to 40 pounds. Suffice it to say that the Be-718 feels substantial, and from what I can tell from Ushers website, I suspect the X-718 is the same way. The Be-718's cabinet looks damn good, with its glossy painted center portion flanked by beautifully finished wood side panels. Porting is accomplished through a slot on the bottom of the front baffle, below the woofer. On the back are big, masculine-looking, high-quality binding posts -- two sets, meaning the Be-718 is built for biwiring. On the front is a removable grille that protects the drivers. Because of its thick frame, the grille is as sonically obtrusive as they come. Remove it for serious listening. Despite the similarities in the X-718 and Be-718 cabinets, the drivers are completely different. Oh, both speakers use a 1 1/4" tweeter and a 7" mid-woofer that are made by Usher; however, the Be-718 uses the model 8948A paper-cone mid-woofer, whereas the X-718 uses an 8945P paper-cone unit. The former is Usher's best driver of that size, while the latter is two steps down (theres an 8945A in between). Its the Be-718's tweeter, though, that is going to garner the attention of consumers. It also explains part of the Be-718's model designation. The tweeter's dome is made from beryllium, "Be" in the periodic table of elements, and beryllium-dome tweeters are all the rage in many high-priced speakers nowadays because of the material's stiffness and light weight. (The X-718, on the other hand, uses Ushers 9950-20 soft-dome tweeter, a more conventional driver.) The Be-718 is one of the least-expensive beryllium-based speakers on the market, but not the least expensive. Paradigms new Signature v.2 series has beryllium-dome tweeters as well, and a couple of the stand-mounted models (the S1 and S2) are priced a little lower. However, good speakers are about more than just the parts. Its the way everything is mixed together and made to work that matters, and this is where Dr. Joseph DAppolito comes in. Dr. DAppolito, who lives in the United States, has one of high-end audios big brains. He's the inventor of the DAppolito driver configuration, which places drivers in a mirrored configuration around a central tweeter. He's a true expert. In his capacity at Usher, he is said to be the consultant to the company for the crossover design. The crossover can be thought of as the "big brain" of the loudspeaker. It governs how all the parts work together. In this regard, the X-718 and Be-718 are similar again: Both transition the mid-woofer to the tweeter at 2kHz. This is done to create a smooth transition between the drivers, optimizing their dispersion characteristics through the crossover region. However, Dr. DAppolito isnt the only one who worked on the Be-718s crossover. Danny Richie of US-based GR Research had his hand in it, being tasked with employing premium crossover parts that would inch the Be-718s performance even higher. The Be-718 is therefore a collaborative effort. And all this collaboration results in a speaker thats specd out like this: claimed frequency response from 42Hz to 35kHz (+/-3dB), 8-ohm impedance, and 87dB sensitivity (1W at 1m). I dont have a problem with any of that, except the sensitivity. On the surface, 87dB is the norm for speakers of this size and configuration. However, although I didnt find these speakers to be a difficult amplifier load (in other words, the Be-718 doesnt seem to present some wonky, low impedance), I found that I needed to throw more power at it than is necessary with similarly specd speakers to get it to play at a loud level. I suspect that the sensitivity is overstated, somewhere below 85dB. This doesnt have anything to do with sound quality, but it does mean that youll need a sufficiently powerful amplifier in order to get the best from a pair of Be-718s, something Ill elaborate on below. Associated electronics were from Simaudio's Moon Evolution series: SuperNova CD player, P-7 preamplifier, and W-7 power amplifier. I used Nordost Quattro-Fil interconnects and a single run of Nirvana Audio S-L speaker cable. I used jumpers to connect the two sets of binding posts. I put the Be-718s on 24"-high Foundation stands -- some of the sturdiest, most inert speaker stands Ive ever used. Theyre great. The speakers were placed well away from the front wall (about eight feet) and the side walls (greater than four feet). This left about a seven-foot spread between the speakers. The reason I pulled the speakers so far out into the room was so I could hear more of what they were doing rather than what the room was contributing. Toe-in was a modest 10 degrees -- I could still see the inner sides of the cabinets. Usually minimonitor reviews include some obligatory caveat about the lack of bass extension somewhere in the text. After all, with small drivers and cabinets, its usually not possible to reach down too far into the bass region; therefore, the reviewer usually explains that missing bass away. The Be-718s are the exception to the rule. I put Blue Rodeos Five Days in July [WEA CD 93846] in the CD tray with my left hand, pressed Play with my right hand, and then almost had to decide which hand to use to pick my jaw up off the floor. Ive never heard a speaker this small go so deep. The bass didnt sound loose and sloppy either. Rather, drums and bass guitar were tight and controlled, and the overall presentation was big and impressive. Id swear the Be-718s were moderately sized floorstanders, not some pipsqueaks on stands. To glean more about the bass, I next played Sades Love Deluxe [Epic EK 53178] and "No Ordinary Love," a well-produced cut with deep, rich bass. Once again, I was bowled over by how deep these speakers went and how full they sounded. In fact, they sounded far more full than the floorstanding V-602s, which have the same size bass driver. Usher specs the Be-718s -3dB point in the low end at 42Hz, which seems entirely reasonable. That would put the -10dB point somewhere in the mid-30Hz range. However, to reach that deep, Usher has sacrificed sensitivity, because I found I had to throw quite a bit more amplifier power at the Be-718s than is usual for speakers of their size. For example, if theyre only 84dB sensitive or so (likely closer to what the Be-718s really are), that may be a mere 3dB difference from 87dB, but to increase the SPL by 3dB, you need a doubling of amplifier power. So, if a 25Wpc amp is good enough to power some small speakers to modest listening levels, youll need a 50Wpc amp if the speakers are 3dB less sensitive. In fact, 50Wpc seems like a good start with these speakers, and more is better if youve got it. The Simaudio W-7, for example, is rated to deliver 150Wpc, and although I wasnt close to taxing it, I liked knowing I had the headroom as I pushed the preamp's volume control higher than I had with any speakers before. But as I said, sensitivity isnt an indicator of sound quality, and providing that you have the power for them, the Be-718s are as accomplished in all other areas as they are in the bass. The midrange and highs, for example, are ultra-clean and neither pushed forward nor recessed. In fact, this is as well-balanced a loudspeaker as Ive ever heard. And while the highs are infinitely extended, theyre never harsh or hashy, even when I pushed the speakers hard. In fact, the highs extend so sweetly to the very top and out of earshot that the tweeter doesnt bring any kind of attention to itself, which is a very good thing. Overall, the Be-718s arent just extremely well-balanced speakers, but very transparent ones as well. And despite the modest sensitivity, the Be-718s maintained their composure admirably when I played The Clashs London Calling [Epic EGK-36328] at 11. Yes, these speakers can rock hard -- impressively so. But, despite the ability to get raucous and play quite loud, the Be-718s arent just for rock or home theater. They can probably take abuse, but theyre way too good for it. Overall resolution and the ability to reveal the little details in a recording are first-rate. Like the very best small speakers Ive heard, the Be-718s convey the space in the hall, the tiny nuances in the music, and even the defects in recordings. For example, Five Days in July is a great-sounding album, but occasionally you can hear some hum from the recording equipment, the musicians movement, and other subtle mistakes that are masked when heard through lesser speakers. I also played Mark Knopfler's new release Kill to Get Crimson [Mercury 0251742073], and I was awestruck at how full, rich, detailed, and refined it sounded through the Be-718s. In fact, the Be-718s deliver as close to state-of-the-art sound as you can get from speakers that cost less than $3000. Such refinement and resolution also translated into a well-defined soundstage with pinpoint image placement, a splendid sense of space, and a more-than-credible illusion of depth. These arent quite the best speakers Ive heard in that regard. YG Acoustics $28,000 Anat Reference Main Module still holds the top position for me in terms of image specificity and soundstage placement, but these fraction-of-the-price speakers come remarkably close. In fact, "remarkable" is a word that sums up the performance of the Be-718s quite nicely. These speakers perform so well that I have only two real caveats. First, theyre power-hungry, so you have to make sure to partner them with an appropriately powerful amp. Second, their generous bass may mean that theyll overload some very small rooms, or they may sound too full if you place them too close to wall boundaries even in larger rooms. Give the Be-718s power and space and you may well find yourself as bowled over by their sound as I am. The Be-718s may need stands to prop them up, but theyre a clear step up from the floorstanding V-602s ($1040 per pair). Theyre built better, they look better, and they sound better across the board. From the bass to the mids and up through the treble, the Be-718s sound fuller, cleaner, and more refined. Soundstaging, too, is better, and theres a stronger illusion of depth and a better ability to re-create the space of the recording venue. Then again, the Be-718s should be that much better at more than twice the price. The V-602s are very good for the money -- an audio bargain in my book -- but the Be-718s are very good, period. In fact, they stand among the very best minimonitors I've heard. For example, PSBs $2000-per-pair Platinum M2s have always been a favorite of mine for their neutrality, ability to expose musical detail, and capacity to play extraordinarily loud and still remain composed. However, the Be-718s are every bit as neutral and detailed, and can play quite loud as well, although not as loud as the M2s. But the Be-718s are richer-sounding, go quite a bit deeper in the bass, and map out a soundstage with better specificity and depth. The only place the M2 inches ahead is in terms of sensitivity. Youll need less amplifier power with them. More competition comes from Paradigms Signature S2 -- speakers I own. Over time, Ive found the S2s more pleasing to listen to than the M2s and feel that theyre a reference, approaching cost-no-object performance at a reasonable price (about $2000 per pair, depending on finish). As I mentioned, the only problem is that Paradigm now has the v.2 iteration of Signatures out with beryllium tweeters. I haven't heard them -- yet. A Be-718-Signature S2 v.2 comparison would be ideal. However, heres how the Be-718s stack up against the original S2s. As it was with the PSB M2s, the S2s go deep in the bass, but not nearly as deep as the Be-718s. If you want rich-sounding speakers that play very deep and maintain strong articulation down there -- no sub needed -- the Be-718s are for you. However, as I said, they seemed to sacrifice sensitivity to get there. The Signature S2s play louder with the same amount of power -- much louder -- and I could see someone partnering the S2s with lower-powered amps, even some with tubes, but I cant say the same of the Be-718s. You really have to give the Be-718s some juice to make them sing. And when you do give them that juice, they really come alive, but they actually sound a touched restrained compared to the Signature S2s. I dont mean "recessed"; rather, the S2s have a slight lift in the top end -- just a touch -- so the prominent cymbals on Blue Rodeos "Hasnt Hit Me Yet" from Five Days in July are a touch more prominent through the S2s than through the Be-718s. This makes the S2s seem more lively. However, at the end of the day, I found that the Be-718s sounded a touch more refined in the treble region, which really surprised me, given how good the tweeter of the S2 is. Overall clarity and retrieval of detail are comparable with both speakers, particularly through the mids. Theres no better or worse in this regard -- just some subtle differences. But when it comes to creating an expansive, enveloping soundstage with a strong sense of depth, the Be-718s move ahead again. This is most likely a result of their extraordinarily deep bass. When you have deeper bass (for example, when you add a sub or when a speaker simply goes lower), the low-frequency enhancement always seems to result in a deeper soundstage. In the past, Ive referred to PSBs Platinum M2 and Paradigms Signature S2 as the pinnacle of common-sense bookshelf speaker design. They vie for the state of the art without costing an arm and a leg and employing questionable technologies. The Be-718 costs a bit more than these speakers, but its clear to me that the extra money can easily be justified. The Be-718 is every bit as good, with some additional attributes of its own. My cost threshold for what I consider "common sense" has moved upwards a little. When I consider the overall sound from any small speaker Ive auditioned, the Be-718 is the best that Ive heard. Its exceedingly well balanced, surprisingly neutral, and extremely transparent. It also has the best bass extension I've heard short of a big floorstanding speaker. The only caveats are that youll need a sufficiently powerful amplifier and that youll have to give the Be-718 room to breathe, given its generous bass. To me, those limitations are not too hard to accept. So, while a $2795 speaker isnt cheap, the Be-718 can be considered a good value because its one of the very best minimonitors you can buy. In fact, based on my experience with all the small speakers Ive reviewed, the Be-718 is now the reference in the category. Price: $2795 USD per pair.